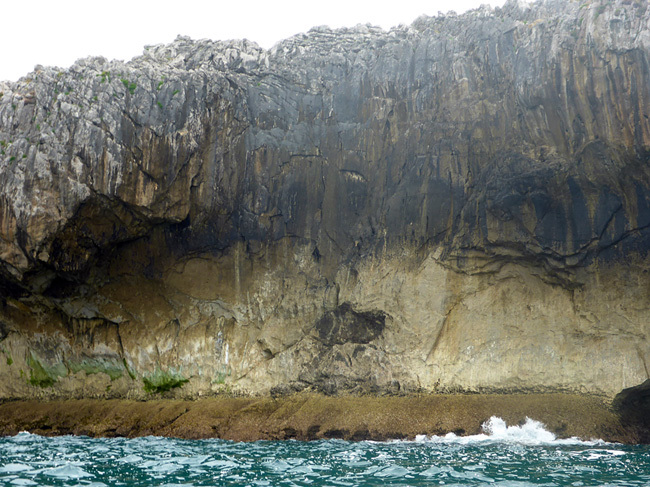 Rumenes – the best tufas in Roca Verde?? 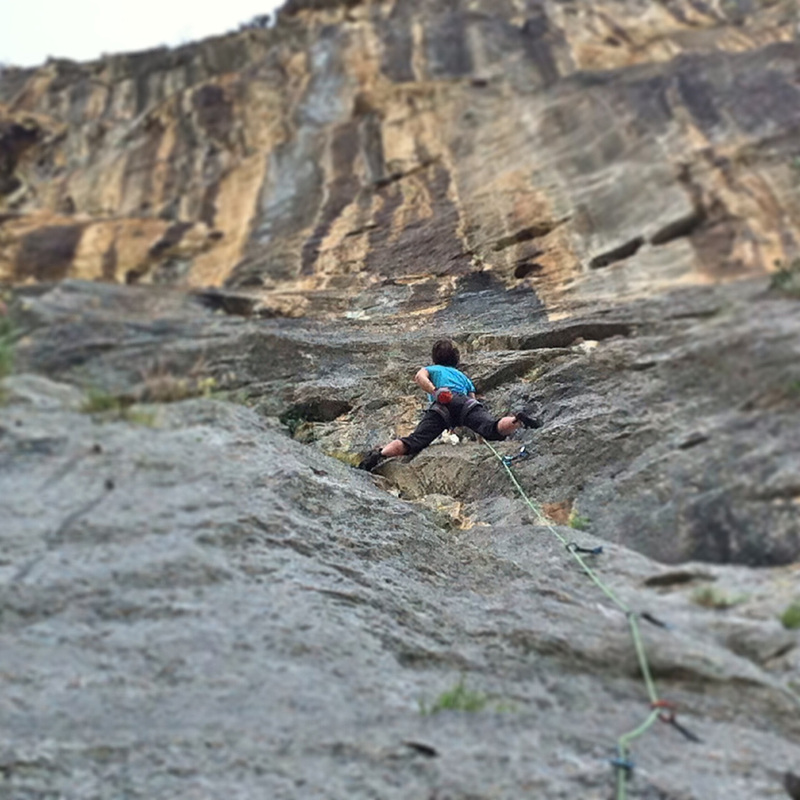 An amazing venue and the best ‘tufa’ climbing in Asturias. The walls and routes at Rumenes are simply phenomenal and amply demonstrate the potential in this valley. 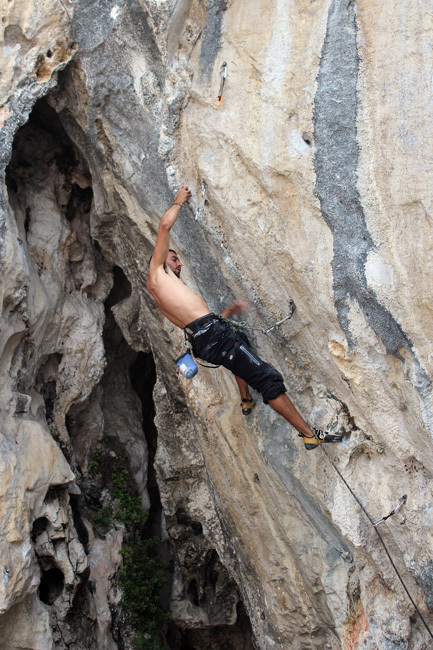 The upper crag for the most part is literally tufa-strewn and provides a series of long, stamina testpieces. Rumenes is probably the most popular area in the Desfiladero – especially now there’s a good guide – and it was interesting to see people there from across Europe. Chatting to an Austrian team they were very impressed with the area (and the guide)…! Shade arrives at Rumenes about 2pm but we arrived late at around 5pm after a long day at chilling out and bathing at the enormous beach of San Vicente about 30 minutes away (good tip). Already at the crag were a bunch of friends of ours – all ex-pats, some living in France some in Spain. The stamina legend that is Mike Owen was working the incredible stamina pitch of Síndrome de Stendhal, a super long 7c+ while his wife Elaine patiently nursed a very sore finger and belayed. As we chatted to the Brits a French couple arrived and we realised it was a couple we’d seen at Teverga a few days before. 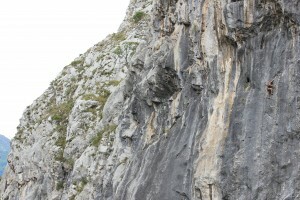 They were enjoying their visit to Asturias and set about sending a few classics: Rumenes power al vino, 7a+, and Invocando de Onan, 7a one of the most ‘tufariest’ routes at this very ‘tufary’ crag!! 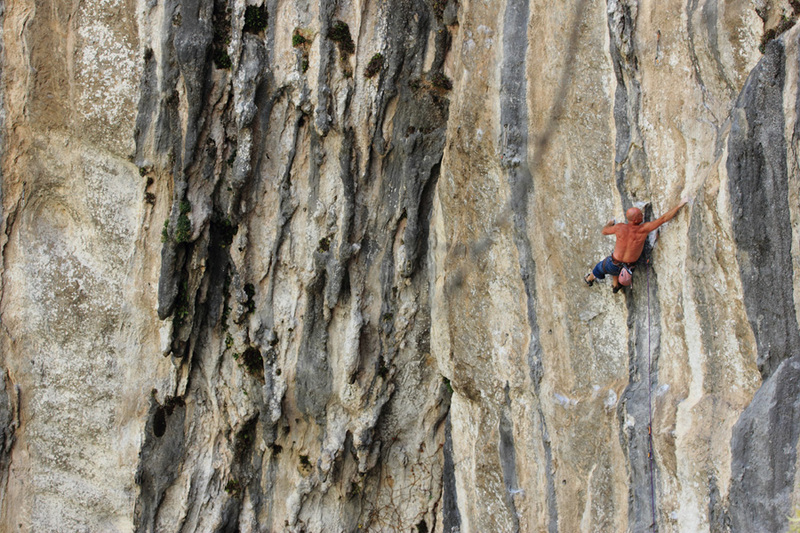 Marek Cincio on El dia del arquero, 7c. 38 metres of pure pump!! Our day eventually started about 6.30 and I warmed up on my favourite, La Tufa, 6b a great little route. However, after a bright start things went rapidly downhill as Mary started to feel a bit ‘sunstrokey’ and my pink flesh was feeling the pinch squeezed into my harness. An abortive attempt on a couple of routes failed and we slunk off down to La Cuadrona bar (another top tip) to be refreshed and revived by Chucho!! All’s well that ends well and we ended the night chatting away to friends we hadn’t seen for a while and vowing next time to use a bit more sunblock!! 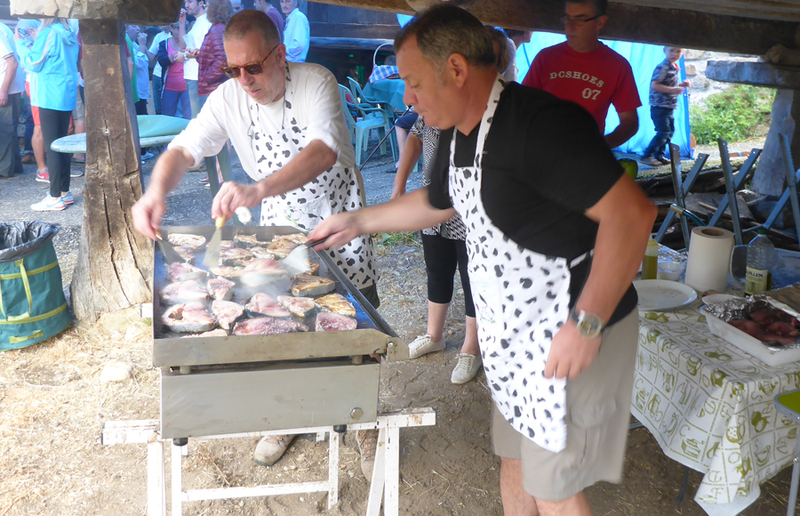 We were slightly worse for wear after the ‘bonitada’ (tuna festival) in the village of Aciera (just under Quirós). As ever Spanish hospitality was fantastic so after about 4pm the next few hours were taken up with a proper siesta (2 hours sleep). After that we managed to get back in the camper van and drive the 10 short minutes from Quirós to park up at a busy Teverga. The next morning the parking was, as usual, buzzing and there were a lot of climbers milling around ready to go…although as usual in Spain loads of them didn’t make a move particularly quickly. So after a quick coffee in the always friendly Bar Sobia we decided on Entecampos – almost the closest sector and still with plenty to do; even though we´d been there loads. Starting on Nirvana 6b we enjoyed the cool fresh air after the previous days storms and marvelled how the crag was completely dry even after the near wash out of the Saturday. 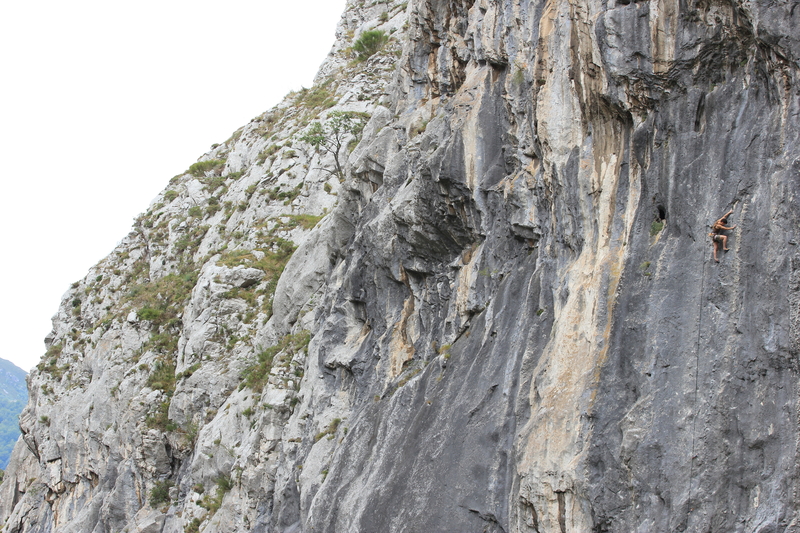 I then jumped on Diablo 6c, the short version and got a shock as it seemed hard than I remembered; fingery and intrictae it would be easy to fall of this neat little route. For a change we the moved to the top of the sector: always empty yet with some of the best routes around. I had done Tijeruca 250 7a/+ before but the quality once again impressed. 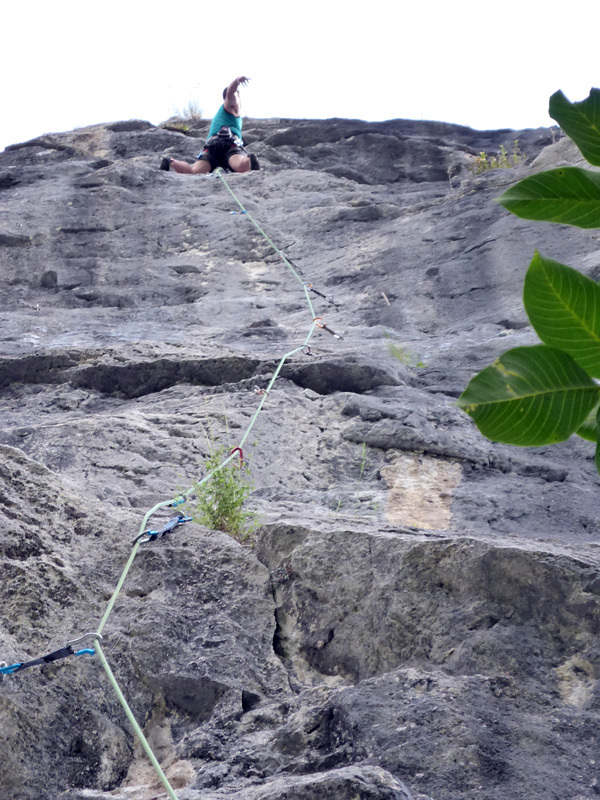 35 metres, 16 bolts and a gently ‘leading you on’ feeling culminating in a pretty tricky move high on the route. 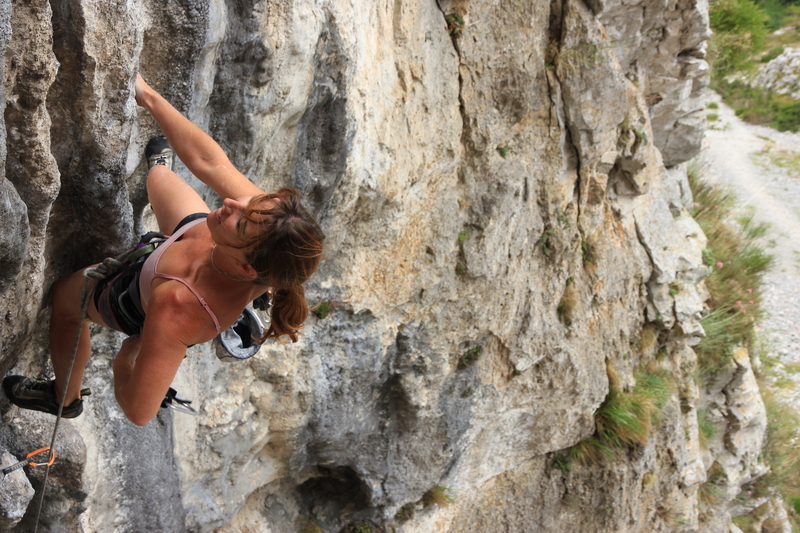 Mary did well on a top rope and my arms seemed as though they recovered / warmed up so I picked a route I’d wanted to do for ages – El último flote 7a+/b. Another long route, this time 28 metres, the start had always put me off – a decidedly thin looking tufa/groove which led to the steep roof and the superb looking tufa groove above. Well the groove was a grim as it looked, super thin and a bit dirty I slapped for the finishing jug of that section very, very relieved!! Motoring through the roof I felt Ok but at the top of the tufa strewn groove the pump hit and form then it was ‘sh%t or bust’ to the top. Crawling higher and higher I though I was going to make it but confronted with the last move my arms failed and a desperate lunge for the top failed…. Lowering off i was both happy I’d got so close but pissed off that this was the first 7a+ i’d fallen off across the whole of Entecampos! Still a great day out and as ever Entecampos delivers!! My memories of Asturias are strong: long, sandy surf beaches populated by locals; rolling green hills not ten miles from the coast; wide open, quiet countryside with a ruralness reminiscent of quieter parts of Provence; drinking strong cider in cider-bars in quiet country towns. 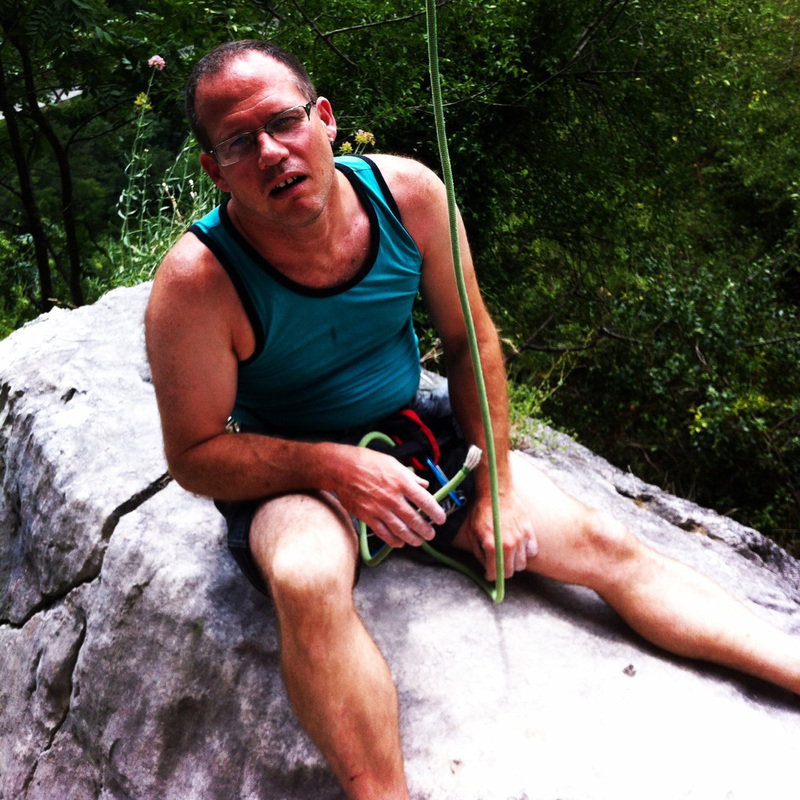 And being on the wrong route on a fabulous sport crag. Asturias is the coastal province on the northern coast of Spain. Think ‘left of France’. It’s a big holiday destination for French and Spaniards, although little known outside these two countries. 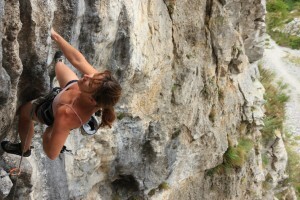 While this may be true from a tourism point of view, it’s an undisputable fact when it comes to climbing. Well perhaps this is about to change. 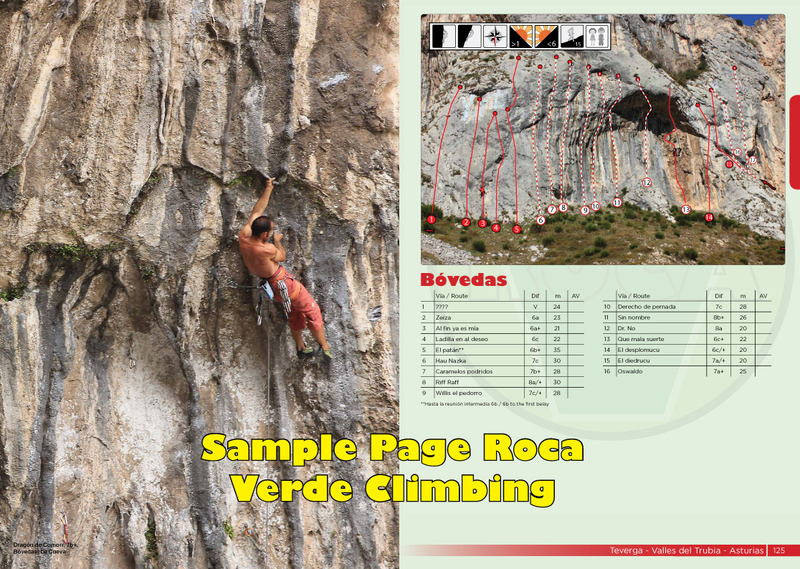 Roca Verde is a new guidebook from British ex-pat Richie Patterson. Richie has been living and climbing in the region now for eight years and has dedicated the past few to bringing information on the local crags together into one volume. As is often the way in Spain, some of these crags were covered in small, area specific guides, and some never recorded before. The result is a book which throws a whole new climbing destination onto the table for rock-hungry Spainophiles to get their teeth in to. It looks amazing. The action shots reveal the blockbusting quality limestone that we have come to demand of Spain – steep walls, overhangs, tufas, orange-and-blue streaks – these are all in evidence here. The routes look cool and well featured and the photos – mostly Richie’s own – make me want to be there. I must point out one thing here: the author has allowed himself the indulgence of putting an okay shot of himself on the front cover, something that hasn’t happened since Andy Pollitt’s day. But we’ll overlook that for now. One thing that turns me on about the photos is the background. 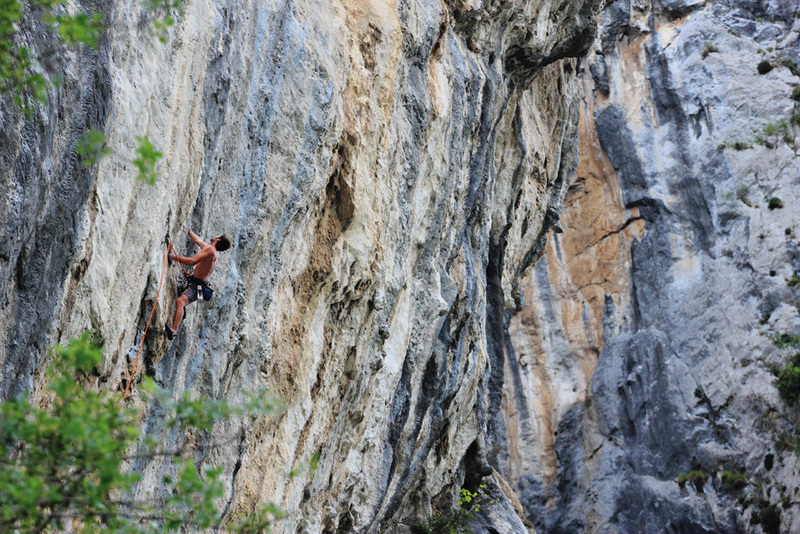 There’s more green around than we have come to expect from Spanish climbing settings. Trees and grass attest to the area’s higher rainfall when compared to the Costa Blanca, but all that dust down on the east side does my head in after a while. I’ll take the odd shower, especially since there are plenty of crags in this book that are weatherproof. There’s a huge amount of rock in these pages. As well as Asturias it covers the neighbouring regions of Cantabria and León combining to nearly 3,000 routes from 2s and 3s right up to tediously-hard 9as. It seems best, in general, in spring and autumn, although lots of the crags I looked at were goers in summer and winter too. The book itself seems to work very well. It is functional, fact and number heavy, as is the way with continental sport guides. Maps aren’t beautiful, but who cares. Out of curiosity I picked a few at random and compared them to Google Earth and they all seemed spot on. Scales would be handy, all the same. Topos are excellent, taken in great light, and serve to showcase crags really well. One last point I had to broach with the author, was what relationship Richie had with locals. To my relief it turned out to be a constructive one. Locals were a big help and in the production and have received the guide well, perhaps helped by the fact that Richie actually lives there. This impression is helped by the fact that, going by the names at least, the people in the action photos are locals. In addition to this, Richie has pledged some of the profits from the book towards local bolt funds. I imagine that goes a long way to making locals happy. Niall Grimes (or Grimer) is a fixture on the UK Climbing scene, publishes climbing books for a living and is welcome to visit any time!! 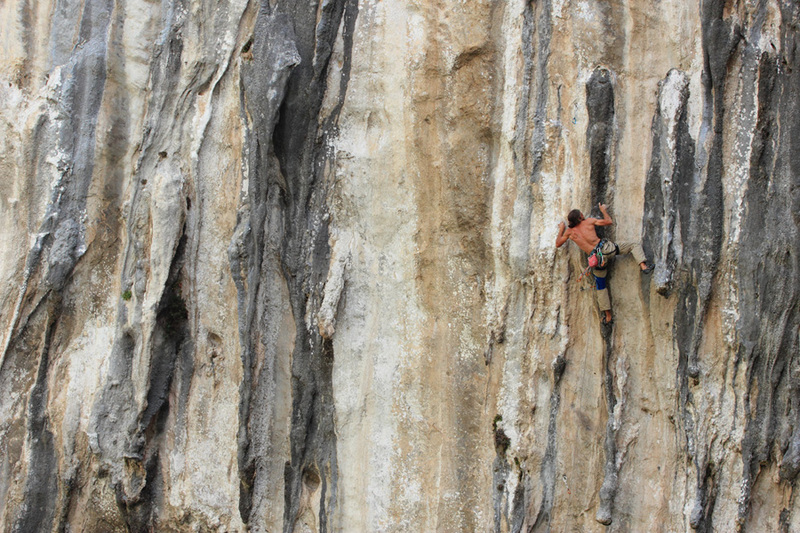 Bovedas in Teverga features 6b slabs and 7b+ tufas!! Sometimes in summer it’s hard to choose between the beach and the rock. The call of the waves and a day chilling out is difficult to ignore, especially as the temperatures climb. Luckily there’s few places in Asturias where you can do both: and on Tuesday in the company of my brother and his family on their first trip to Asturias, we called in at Cuevas del Mar. 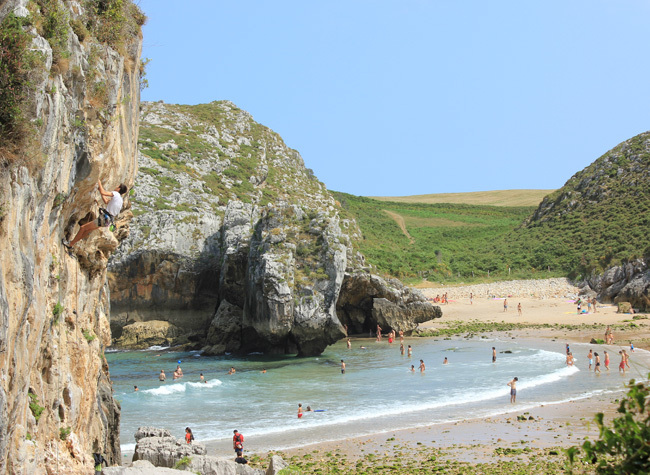 Five minutes off the motorway between Llanes and Ribadesella this is not only a beuatiful beach but thanks to a hardworking local team has been turned into a very popular climbing spot. Recently re-equipped with stainless steel bolts and resin bolts this has turned the area into a safe and fun venue with the emphasis on easier grades and some great beginners routes. Starting on Afición y desorden 6a+, we moved swiftly on to the very tricky route, HonorINOX 6c, two routes to the left which features rounded, almost offwidth climbing!! Not as bad as it sounds it was a bit trickier in the midday heat!! Then it was the kids turn, and one of the great things about Cuevas is the amount of routes for beginners meaning you can brings friends along and let them have a go. 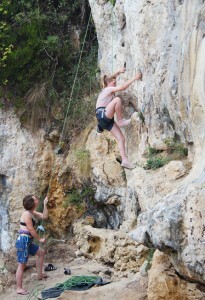 So my brother and his three girls all got roped in (excuse the pun) into trying climbing. However, there’s not just easy stuff at Cuevas and I ended up climbing with a couple of guys from León who were trying the classic tufa of Chochitos a la mar 7b+. 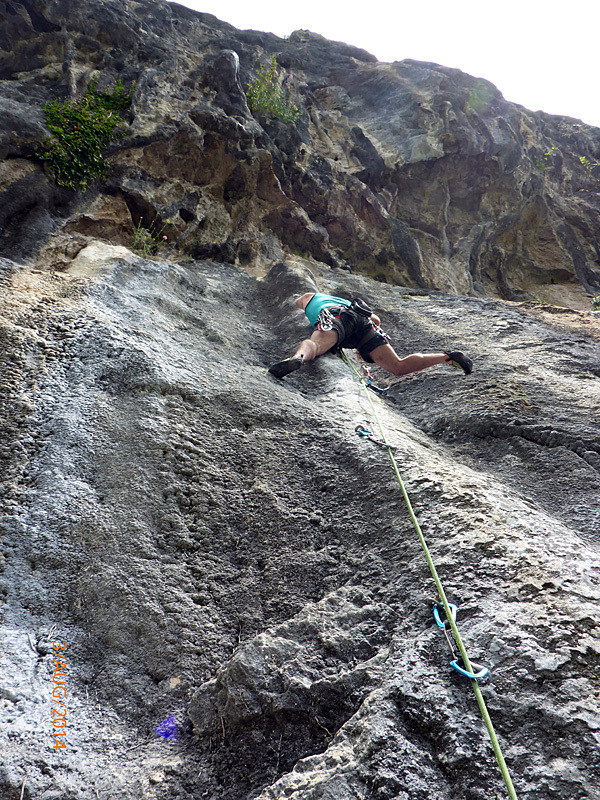 This short but sharp route takes a very steep line and is a much sought after little tick. 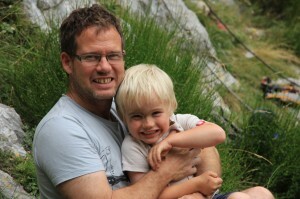 Jorge managed it but I managed to blow after the crux; blaming skin, thin and heat, hot!! 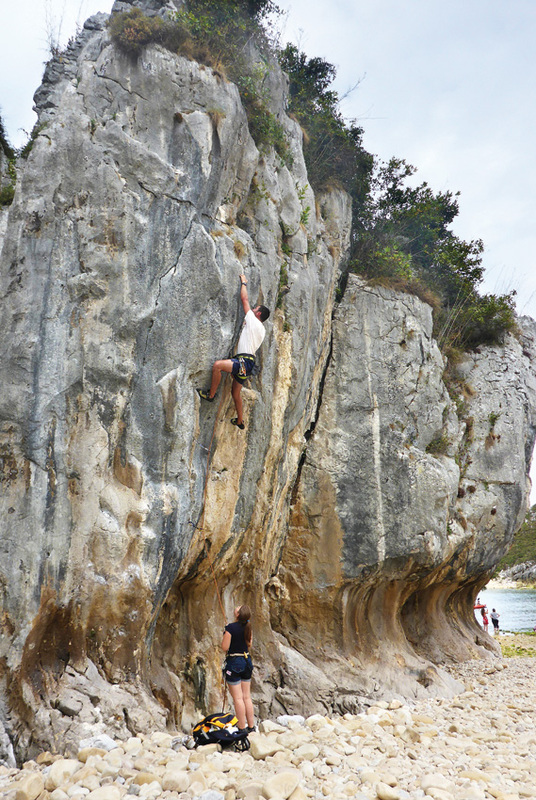 Another great things about Cuevas are the endless posibilities for new routing on the amazing sea cliffs nearby. A trip out in a canoe confirmed as much and with a slightly bigger platform underneath than I thought we will be going back pretty soon to have a play. Cuevas del Mar can be found by exiting at junction 312 from the A8 motorway, heading into the town of Nueva and following signs to the beach. The weekend saw us hook up with an American family who, having bought the guide, had changed this year’s holiday plans and come to Roca Verde country for a month-long climbing trip. We couldn’t help but feel the pressure. What would they think of the book? Were they managing to find their way round okay? And, most importantly of all, were they having a good holiday? To add to the pressure the weather forecast was looking somewhat dodgy for Saturday so we decided to head to Bóvedas in Teverga, a great sector that has the added bonus of staying dry in the rain. We needn’t have worried, as despite a short sharp shower in the morning the rock dried instantly and conditions turned out to be pretty good. Bóvedas was still a winning choice though, with some awesome 6s and 7as to keep Krista and Tim happy, with really interesting and varied climbing packing in everything from some delicate, fingery slab moves to tufa-pulling thuggery. For the kids there was plenty of dirt to play in, which is always guaranteed to bring a smile. As for us, we were just happy to hear that the Maloneys had been having a great trip climbing throughout Cantabria and Asturias and that they hadn’t got lost once. Especially after their confession that they normally allow an extra hour on top of any journey time, to compensate for the inevitablity of time spent going round in circles. Of course the other joyous thing about Bóvedas is that in between goes you can sit and will your arms to recover whilst watching the wads across the way on Pared Negra. All the inspiration you could want to try and pull that little bit harder. Nani, 7c Pared Negra. One for the tick list…..